Like most biennials in the world of herbs, Angelica is a fairly flat mass of a few large leaves the first year. The second year the Angelica plant rises to a towering four feet as it puts forth its flowering stalk. Occasionally, Angelica will return a third or fourth year; but, if you want to rely on it being there, it is best to plant every year. There is some sweetness in Angelica's flowering stalk, which may be peeled and cooked, or, as often suggested, candied. Chopped Angelica root was added to the notorious addictive liqueur Absinthe (banned in this country from 1913 to 2007), probably to tame the taste of the acrid Wormwood. Angelica plants are in the Apiaceae family (formerly the Umbelliferae family) which makes it related to Dill, Chervil, Caraway, Queen's Anne Lace and Lovage. 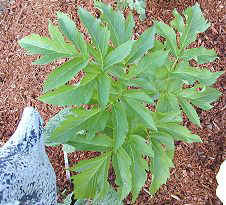 Like Lovage, there is a slight celery flavor in the leaves of Angelica and they can be used as a substitute for this in recipes. Angelica has a few toxic look alikes in nature so be very sure that if you didn't grow it yourself you know what you are harvesting. One of the most unusual uses for any herb has to be candied Angelica stalks. Be sure to use only fairly young stems. Angelica has also been used to flavor Vermouth and Chartreuse. In a Modern Herbal, Maude Grieve gives us a recipe for concocting your own Angelica liqueur, delicious and good for the digestive system. An ounce of freshly gathered stem of Angelica is chopped up and steeped in 2 pints of Good Brandy (none of that cheep stuff) with 1 ounce of bitter almonds reduced to a pulp for five days. Strain through fine muslin and add a pint of liquid sugar. Angelica has a way of enhancing the flavor of some fruits, rhubarb in particular has been paired with young Angelica leaves to reduce the acidity of the rhubarb. For the most part, we enjoy it as a tall interesting ornamental. If you let it reseed, it should sprout the next year. If you collect the seed, you must sow it immediately. After only a few weeks, the germination rate for Angelica seeds declines dramatically. There are about 30 species of Angelica. In the 1930's, Maude Grieve also wrote that A. archangelica is the only species employed medicinally. Her knowledge, though vast, was restricted to the European and American continent. We now know that the Chinese have been using Angelica sinensis or Dong Quai for centuries. Angelica makes an interesting addition to our Gourmet Herb Garden Six Pack and a tasty addition to our Edible Flower Herb Garden Six Pack. This plant is sometimes available in plug trays. These trays hold 128 of all the same plant. They are a great low cost way to fill a lot of space. Each cell is 3/4 of inch by an inch. Check here to see if Angelica Plug Trays are available.